In January 2007 my friend Alan Macdonald and I decided we would open our own martial arts club and affiliate it to the BCA. We were inspired by Peter Consterdine's training day DVD's and wanted to provide a system which would incorporate practical skills, but also fulfil some of the physical, emotional and spiritual needs of modern day living. We realised after speaking to potential students that lack of motivation and time were amongst the main reasons why they didn't train regularly. We came to the conclusion that training is easy, doing it is hard. In today's complex and frenetic world it's easy to forget that time has to be made to take care of ourselves. To make matters worse, today's lifestyles are designed to make us fat. We may have good intentions to get fit and healthy – but more often than not all the excuses appear. “I am too busy at work, I have so much to do at home, I have no time because of my family commitments etc.” The demands of the modern world leave us exhausted as we get further away from connecting with our real selves - we give in and become slaves to our environment. We often hear the statement ‘I just can't get motivated to train' – our standard reply is: ‘you train to get motivated'. The simple pleasures of life are the sweetest – swapping sweat with committed training partners and a good shower and banter after the session can be a very rewarding and healing experience if you have had a bad day at the office (or a bad hair day!). Participating in an interesting fitness system can be our way out of the modern day curse. 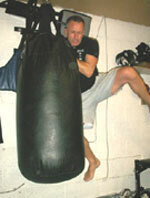 Training in the martial arts can provide physical, mental and spiritual benefits. We believe there are many benefits derived from regular striking practice. Correct impact training on a bag, pads or a training partner can have a positive impact on a person's health, fitness, and self confidence. 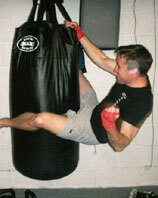 Punching and kicking drills are an excellent form of exercise; they are vigorous enough to get you into terrific shape and are a great supplement to other sports or fitness activities. They can also be customized to suit a student's specific level of fitness. Our FFMA sessions are designed to gradually strengthen students in an environment that is safe, friendly and interesting. 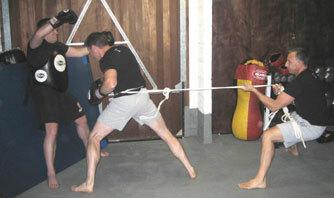 The training incorporates a variety of techniques derived from many forms of martial arts including but not limited to; Karate, Kick Boxing, Muay Thai, Mixed Martial Arts, boxing and other international systems. We respect all forms of martial arts. Cardiovascular blast: performing the punches and kicks in a light and snappy way without the need to apply excessive power (while learning how to strike from innovative drills). Advanced session: if you are an advanced student then power can be applied as you already have an understanding of self protection based combat drills which incorporate punching, kicking and blocking. High intensity: raising the intensity of the training to the point of training in oxygen deficit which provides a fitness level equivalent to that experienced only by top athletes. Training routines are our test laboratory; they enable us to make sense of the confusing messages that are sometimes found in various martial arts sources. We just train and experiment (and have fun at the same time). We can calibrate what we do by attending some of the BCA courses which provide a platform for a high standard of martial arts instruction. I'm an engineer working on power stations all over the planet. In my world adjustments are made as and when necessary to make something work better. Experiments are done until the right conclusion is reached, failures are just events designed to get you closer to success. Our training principles are based on doing what feels right by actually drilling and testing them. It is the individual who decides what is best for them as no two people can ever have the same body shape or movements. Rocky Marciano was told by a boxing coach that he should change his technique because it was not conventional; Rocky replied; “why would I want to do that when I'm knocking everyone out”. One common comment we often get is “I am too old to train in the martial arts”. Fortunately I can use the example that I'm 50 and Alan's 44 and we're still training. They often ask me how I cope - my standard response is: ‘the older I get the faster I was”. Our view is you train at the pace that suits you. Age does not really matter; regular exercise will keep you healthy. In my travels across the world as an engineer, I have found that the old power stations that are abused, pushed to the limit and not correctly maintained are the ones that suffer a ‘forced outage'. It means the plant is forced out of action; this same universal law applies to us. FFMA is a striking martial arts system that provides students with practical self protection, fitness development and a sense of well being. The system uses numerous pad drills, sparring and a combination of fitness and strength exercises to enhance the students overall capabilities and general health. Seminars and testimonials on the FFMA system are available on request. FFMA has been filmed by WOMA and is currently on the WOMA site. Clips of the filming were shown at SENI on the 26 th and 27 th of May. Our first seminar was for the officers at the combined forces headquarters in Swindon. We end this article by expressing our thanks to Peter and Dawn at the BCA for all their support in our new venture and for providing us with an environment which promotes a community spirit with no egos or politics.